Americana! The word evokes small town charm, friendliness of a bygone era. But in some small towns across the United States, Americana is as real today as it was long ago. 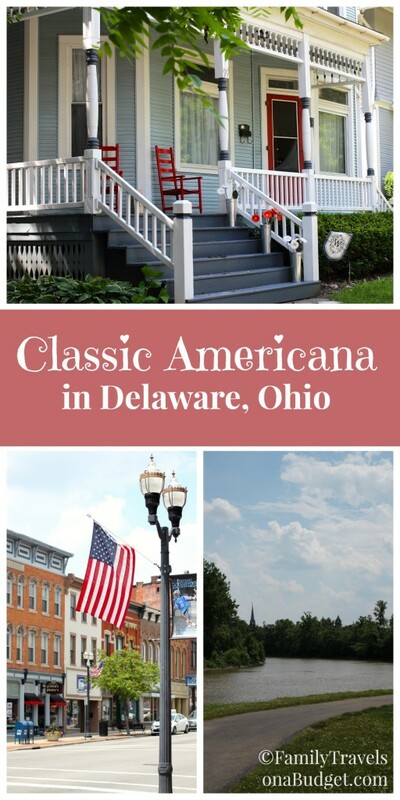 Truly a step back in time, Delaware, Ohio charms visitors with its friendly people and classic beauty, like Victorian homes with inviting red rockers! 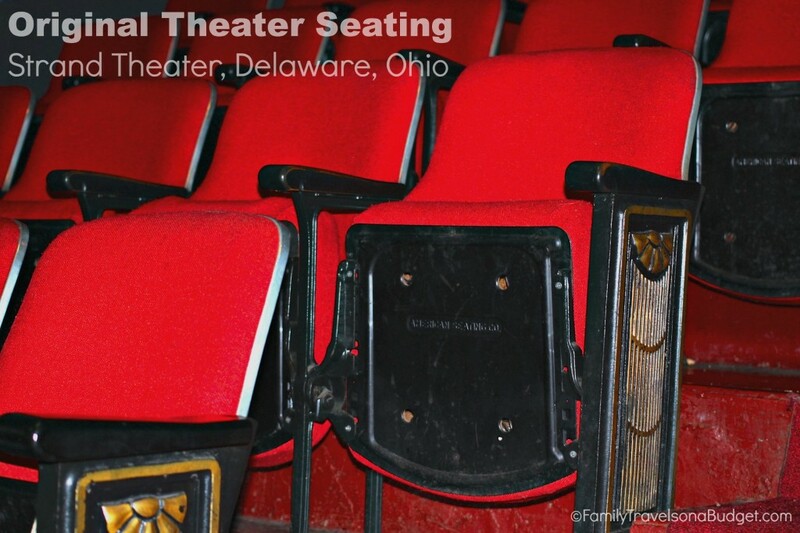 When I hear talk of “Americana,” Delaware, Ohio is the vision that fills my mind. The week we moved to Delaware, my then-young son and I went downtown to explore the shops along Sandusky Street (which is any small town’s equivalent to Main Street). When we set out, the sky was bright blue, with white puffy clouds. As often happens in Ohio, within an hour, that sky turned black and the rain poured down. Nathan and I were caught quite unaware. We ducked into the nearest shop — an art gallery of all things. Not the place to take a 2 year old boy who is dripping wet! The owner graciously welcomed us inside. She ducked into the back room and retrieved some clean towels so we could dry off. And, she made Nathan feel welcome, despite the expensive displays in tempting toddler reach! A couple minutes later, a sheriff’s deputy came in, shaking off his umbrella before depositing it in the stand by the door. He smiled broadly as he saw my drenched boy, held out his hand and greeted him with a friendly shake. As the rain poured, we chatted. When the rain let up some, I made my way to the door. Nathan had been an angel to that point, but I didn’t want to push my luck! The deputy walked us to the door, reached down for his umbrella and handed it to me. He said simply, “Looks like you need this more than I do.” I resisted. After all, we were already quite soggy. He insisted. I knew right then, I am a fan of small town America! Earlier this summer on my “Great Ohio Road Trip,” I got to spend a few days with old friends in Delaware remembering the “good ole days!” I enjoyed soft serve at The Dairy Depot, a Delaware institution serving ice cream from the same walkup window for as long as anyone can remember. It’s not fancy, but it’s tradition. I also visited the Strand Theatre, which is one of the oldest continuously operating theaters in the United States and is undergoing a massive renovation to bring it into the 21st century. When I arrived, I was introduced to Jacob, an 8th grader volunteering his time this summer to help with restoration and preservation. (His parents have raised him well. He is polite, knowledgeable and passionate about his hometown history!) He took me on a fabulous tour of the theater, showing me the old seats getting ready to be replaced and the marquee letters. He explained that the theater has letters from several different eras and that they plan to keep using them. Some, though, will be displayed in the theater museum when complete. Despite an active renovation project that will bring it into the digital era, the Strand’s classic charm remains. 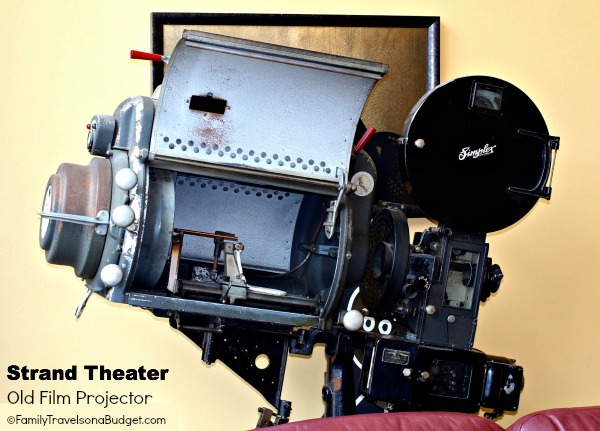 Old film canister projector on display in the Strand Theatre lobby. It will be included in the museum when complete. As I strolled along Sandusky Street, I was struck by the fact that it looks unchanged. Sure, shops have come and gone, but the quaint Americana remains. After taking a photo, I noticed a man standing nearby — hands folded in front of him. We smiled to one another, and he said, “I didn’t want this old coot to ruin your picture.” Truth be told, his warm smile would have improved it! I’m beginning to realize that the charm of small town America, preserved so well in Delaware, Ohio, doesn’t come from the stores and shops. It’s in the DNA of the place. Most of the people I knew 20 years ago when I moved there still live there today. It’s one of those rare places where people come to stay. In my next post, I’ll share why Delaware makes a great weekend getaway destination… but for today, I just want to savor her classic Americana charm! Have you ever been to a small town like this, home to friendly people and simple pleasures? If so, I’d love to know where it is. Please leave a comment sharing your favorite American town! I love this! I moved to Delaware the summer before my 4th grade year. I lived on Heffner st for a year, then we built a house out west of town on route 37 just before you come to Houk Rd. Living there was great! In middle school we celebrated America’s bicentennial in style…the whole town was in red,white and blue all year…wish I had taken pictures of the cool fire hydrants, but I bet it is all recorded at the Delaware historical museum. We moved in 1983 and I never have returned. My brother goes every summer to see his in-laws but I never have really visited since 1985. I yearn to go back but the memories are so wonderful…and so painful too, as in melancholy. I loved Delaware…I cried when my parents sold the house. I was 19 years old when I left. 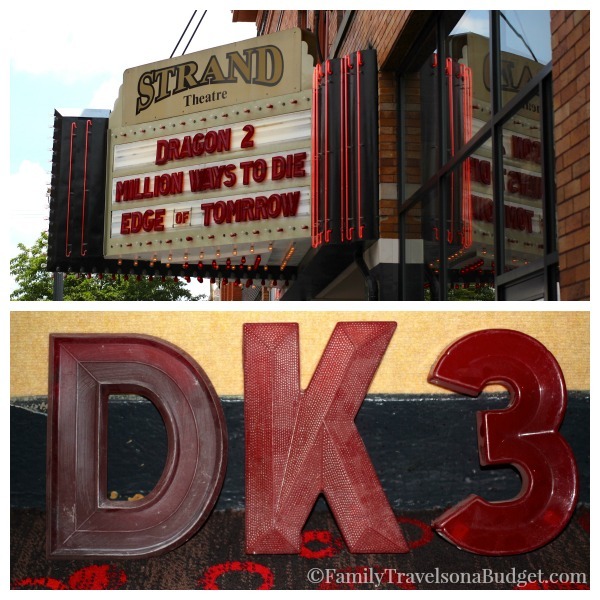 I lived at the Strand theatre every Friday night, back when a movie just ran for one week. My best friends and I would see a new movie every week my junior and senior years in HS…still have the ticket stubs in my memory books. Wow…Those red seats! Thanks for the pictures . The only time I can remember when the movie didn’t change for weeks was Saturday Night Fever and Star Wars. I saw those movies… and every other movie .if it was one that was worthy of my allowance.My best friend in 4th grade knew the owner and we got to see the reel room often. Even in high school, someone would man the reels and we would have to sit and wait if something happened to the reel in the middle of the movie.lol! What fun memories. I live in Georgia now and my youngest is 19…time for a road trip.I can visit my sister in-laws mom. Oh my goodness. 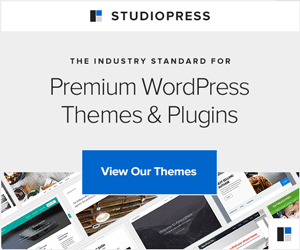 I write this blog to stir emotions and inspire people to travel — but to help you reconnect with your past. That is so cool! Though, the melancholy is not so much. We lived there from 1996-2001 and loved it. Didn’t see movies like you did, but loved downtown and ice cream and Mingo pool. In this hectic world, Delaware is a well-preserved gem. I grew up in a small town, and well i still live a mile away.. it is a really great feeling to know pretty much everyone around you. I grew up in a small town on the Hudson River where everyone knew everyone else. My Mom still lives there. If course it has all changed now–but the small town feeling is still there. All up and down the Hudson River you can find towns that are very similar and have retained the old world charm. In the greater Buffalo area there are a few small towns that carry this sort of charm…I enjoy a visit to one every now and again! This one looks nice. Cannot wait to read about more. Love the vintage design of the Dairy Depot logo. It’s nice how that theater looks well-maintained all these years. I have relatives that live in Delaware Ohio. They own an old farm. Delaware reminds me of my Home town, Ishpeming MI. Everyone knows everyone and people are always willing to help others when in need. I love living and growing up in a little town. Thanks for sharing. That is so nice of the sheriff to hand over his umbrella. I love it when I hear stories like this because public officials often are seen for the negative things they do. I know. In Delaware, they are truly friendly… as is true across much of the country. We just don’t hear the good side that often.